There are quite a few playing tips we can give you for Microgamings Bonus Blackjack game, but first let us take a look at the facts and figures surrounding this game. If you are playing the base game alone, then when played with perfect strategy, you will have a house edge of 0.39% to overcome. However there is an additional Bonus Bet you can opt to place, this is in additional to your base game wager, and when certain hands have been dealt to you (see below) a set of extra payouts are awarded. 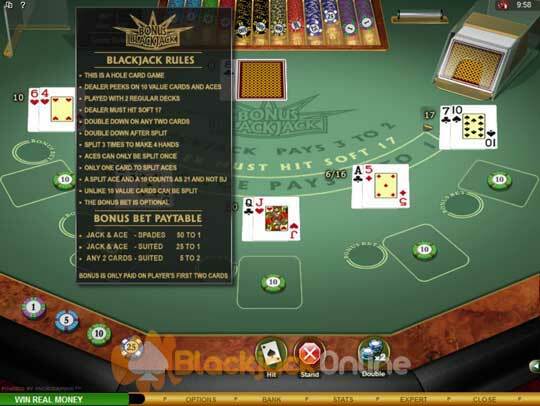 We have a great way for you to always be able to play Bonus Blackjack at Microgaming powered casinos perfectly, and that is via our Bonus Blackjack Strategy Card (right), which shows you how to play each and every hand with the correct strategy, no matter what cards either yourself or the dealer have been dealt. 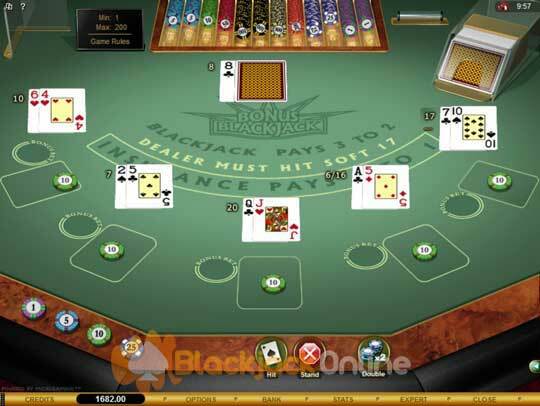 Placing the Bonus Bet - The main attraction of Bonus Blackjack is of course that you could trigger a set of bonus payouts, when certain hands have been dealt to you. However this is not a good bet to place, as the house edge on it is a massive 6.46%. So you are best advised to steer clear of this additional bonus bet! Hitting a Pair of Sixes - Be aware that you should only ever hit a pair of 6’s when the dealers up card is a 8 to Ace. Should the dealer have dealt you a pair of six’s and be showing a 2 to 7 valued card, then split that pair! Splitting a Pair of Fours - There are only two occasions when you should split a pair of 4’s instead of hitting them, and that is when the dealers up facing card is a five or a six valued card. Dealer Rules - The dealer will be dealing from a 2 deck shoe on this Bonus Blackjack game, and whenever the dealer has a hand valued at a soft 17 or below he will hit that hand. Being a hole card game the dealer also peeks when he could have a Blackjack hand. Player Rules - This Bonus Blackjack game will allow players to double down on any two cards whilst also allowing players to double down even after they have split a hand. Splitting is of course permitted, and all pairs including ten cards which are not matching cards may be split, you can split a hand 3 times in total, but Aces only get dealt one card to them and a pair of Aces cannot be re-split. Payouts - Their are a range of bonus payouts which can be won in addition to the standard base game payouts on this Bonus Blackjack game. In the base game all Blackjack hands are paid at 3 to 2, and all other winnings hands are paid out at even money, with the exception of the Insurance bet, which has a payout of 2 to 1 attached to it. The Bonus Bet payouts, are paid when you have placed a Bonus Bet wager and are based on the first two cards dealt to you. These payouts are as follows: Any 2 cards suited pays 5 to 2, a Jack and Ace suited pays 25 to 1, and a Jack and Ace in the suit of Spades is the highest paying hand, and gives a payout of 50 to 1.